I was interested to see what music Will and Kate had chosen for their wedding. It got off to a great start, I thought, when Kate entered to Hubert Parry's Coronation Anthem I was glad: the sound of the choral voices helped to humanize the proceedings from the start and this work manages to be ceremonial without the inflated grandeur of some of the more usual choices. Parry did well: for one of the hymns we had Jerusalem and I wondered whether Kate was aware that this work was appropriated by (maybe written for) the suffragette movement. This, and God Save The Queen, were the concessions to patriotism. And during the signing of the register we had Parry's Blest Pair of Sirens: I remember singing this at school and wondering what it was all about. I still had no idea on Friday and thought it would have been nice to have had subtitles on telly. It also occurred to me the choice of Parry might have been a shrewd move: having died in 1918, he's out of copyright - well, someone had to pay for the wedding. Still and all, with three Parry pieces on the menu we were in danger of falling into a time warp. No Purcell, no Handel, nothing from the glorious period of English choral music which produced Tallis and Byrd. Even the couple's exit music - Walton's Crown Imperial - sounded like a bit more of the same. This was written for George VI's Coronation in 1937: did anyone notice that both the start and finish of the service was music for coronations rather than weddings? The surprise of the day was Paul Mealor's Ubi caritas. Looking it up, I'm confused as to whether this was a commission, as some sites say, or whether the couple had already heard and liked it. There is a suggestion it was performed previously, but given new words for the occasion. 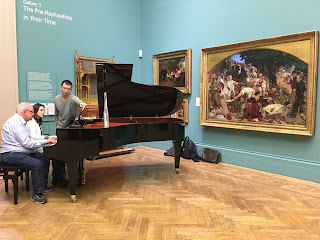 But it was lovely anyway, struck a reflective chord, was unpretentious but not without musical interest; one began to hope the royal couple had some musical taste! The only work that was out of place was John Rutter's This is the day - but why do I feel that? 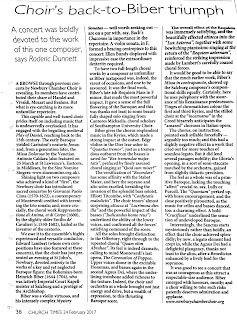 After all, Rutter is one of the most successful composers ever. He's performed the world over. Choirs love to sing his music. Christmas wouldn't be the same without him: he has mass appeal. He's a megastar with all kinds of awards to his credit. So if I'm not careful, any ranting will sound like sour grapes. And yet, I can think of plenty of contemporary composers who could have written a work that would not have felt out of place. For a tuneful work in an approachable vein how about Jonathan Dove? For closure on the Diana story, how about a commission from John Tavener, whose The Lamb was responsible for casting him into the public consciousness after her funeral? Unfortunately, he's unwell and may not have been up for it, I suppose. But how about a woman composer? Wouldn't that have been marvelously appropriate? Cecilia Macdowell writes quirky modern music that is accessible and performable in a religious context, as does Judith Weir. Here was an opportunity squandered. This is the day conformed to every cliché in the book: it was predictable in the way it followed the composer's well-worn methods. I suppose classical sonatas followed a predictable course, but great composers took immense pains to make their material interesting as they went along. This is the day felt churned out. It was ingratiating and made too few demands on the listener, even for a mass audience. Of course, Rutter's music is put together with consummate professionalism. That means the singers can sing it: well, yes, it's easy and fits the voice like a glove, but because something's possible that doesn't make it desirable - and when something's so easy one ought to be suspicious of being patronized; after all, the choir in Westminster Abbey contains some of the best child musicians in the country. Professionalism shouldn't rule out imagination and exploration: one feels there's a head buried in the sand here, a prejudice against experiments of any kind, an unwillingness to deviate from a safe and lucrative path, so what we get is music stuck in a rose-tinted childhood and as nutritious as the candy floss to go with it. We can't blame Rutter: he does what comes naturally to him. But we can blame the Dean who commissioned the piece, one that - more appropriately - will quickly be taken up by every other church, school and village choir throughout Christendom and beyond because the Wedding provided unparalleled publicity and the music is easy to perform.